The concept of federalism is exciting passions in Libya. On Tuesday, hundreds of people danced and sang songs about federalism in the city of Benghazi, as local leaders proclaimed the eastern part of Libya to be the semi-autonomous "State of Cyrenaica". Outside the courthouse on the sea front that same day, a smaller number of people gathered to proclaim their implacable opposition to the idea: "No, no fedraliya," one man shouted out of his car window as he drove past. The drive behind the push for more autonomy in Benghazi seems on the face of it quite reasonable. Many in Libya's second city felt they were marginalised under Col Gaddafi. Benghazi was known as a city of dissent, a place where intellectuals met and formed opposition movements. So the Colonel starved it of funds. The east is also where most of the country's wealth lies, in the form of oil reserves. So, say the framers of the declaration of autonomy, "we just want to ensure we get our fair share." But the presence of the oil is also the reason why the move has met such ferocious opposition elsewhere. Or at least, it is one of the reasons. Mustafa Abdel Jalil, the chairman of Libya's National Transitional Council (NTC) wasted little time in taking to the airwaves to denounce the declaration as a foreign-inspired plot. He would, he added, defend Libyan national unity, "with force" if necessary. But what exactly are the "separatists" calling for? Thair Elhairy, who calls himself the spokesman for the Congress of the People of Cyrenaica, believes the region should revert to a federal arrangement that was in force during the 1950s. Then, Libya was divided into three administrative regions: Tripolitania in the northwest, Fezzan in the southwest, and Cyrenaica in the east. Each exercised a significant degree of autonomy though regional legislatures. "You have different degrees of federalism," Mr Elhairy said. "Different countries have their own model." Beyond the fact that most people at the launch of the "State of Cyrenaica" seemed to want to remain part of Libya, there appeared to be little clarity on what semi-autonomy might mean in practice. And that is no surprise. Libya is a country building a pluralistic political culture virtually from scratch. Under Col Gaddafi's rule, political parties were banned. Politics began and ended with Gaddafi. In June, if all goes to plan, Libya will hold elections to a constituent assembly, whose first task will be to draw up a constitution. This document will have to answer some of the important questions being raised by the declaration in Benghazi this week, such as the relationship between Libya's regions, and the division of oil revenues. But several towns and cities are already forging ahead with their own democratic experiments. In February, the city of Misrata unilaterally held elections to a local council. Libya's third-largest city already runs itself as a virtually independent city-state. No one is demonstrating. The difference is that the Misratans are simply getting on with it, while in Benghazi they announced their autonomy to great fanfare. In these politically embryonic times, public gestures like the declaration of "semi-autonomy" in Benghazi are significant. Mustafa Abdel Jalil later clarified that when he said he would defend the country's unity by force, he did not mean military force. 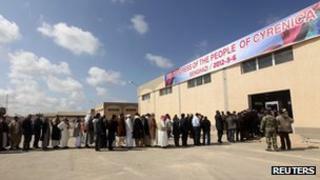 As Libya feels its way towards a post-Gaddafi future, people are experimenting with democracy. There is plenty of posturing going on, as different groups stake out their positions.